Here is the solution, how to show filename extension in Windows-10, this example is also for Windows 8.1! Please start in Windows 10 the MS-Explorer, for example via the keyboard shortcut [Windows-Logo + E] and click (or tap on your Tablet PC), View or use the shortcut [ALT+V] and check mark in the checkbox File name extensions and optional the Hidden items, to see the hidden files and folders in Windows 10. 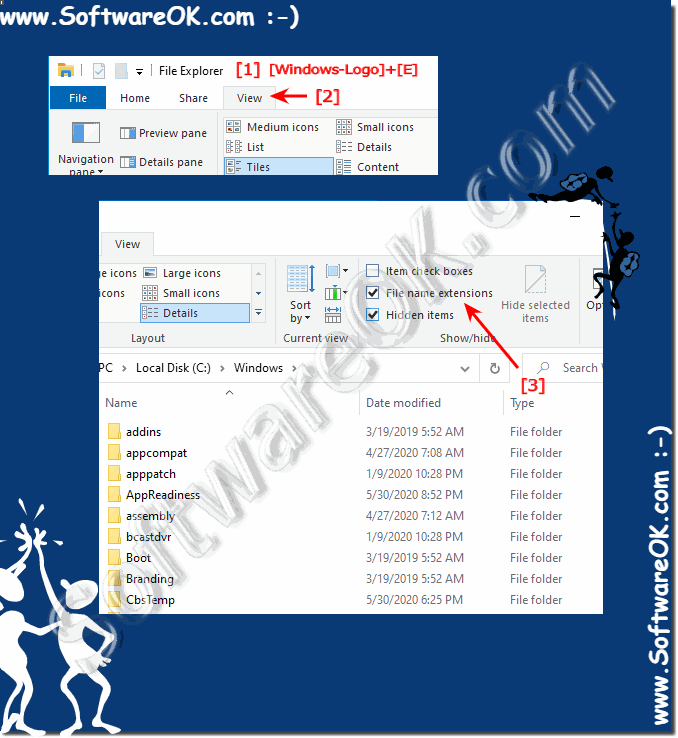 (Image-1) Windows-10 show filename extension! Windows-10 - FAQ-166: How to show filename extension in Windows-10? Windows 10 files folders and extensions? Windows 10 view hidden files extensions? How to Show and change file extensions in Windows 10? How to Change a File Extension in Windows 10? How to view the extension on file in windows 10? How to show hidden files extension in windows 10? How to show or hide file name extensions in Windows Explorer? Filename extension windows program windows 10 explorer? How to display hides file name extensions and folders in Windows 10? How to hide extensions for known file types in Windows 10 Explorer? How to Hidden files extension in Windows 10 Explorer? How to force File Explorer to always show file extensions in Windows 10? Windows 10 hides file name extensions? How to unhide folders and file name extensions? How to show file extensions in Windows 10 via File Explorer Option?